Home » Brooklyn Dodgers , Cy Young Award , Don Newcombe , Dr. Martin Luther King Jr. , Jackie Robinson , Johnny Wright , Los Angeles , Roy Campanella » How Don Newcombe helped to open the door for Dr. Martin Luther King Jr.
How Don Newcombe helped to open the door for Dr. Martin Luther King Jr. While celebrating the memory of Dr. Martin Luther King Jr. today, I would like to highlight the contributions of one Brooklyn Dodger who had a major part in turning the wheels of the civil rights movement. Legendary Brooklyn Dodgers pitcher Don Newcombe was one of the earlier black players signed by a major league team, quickly following Jackie Robinson and Johnny Wright into the Brooklyn Dodgers organization in 1946. Paired with future Hall of Fame catcher Roy Campanella at Class B Nashua, they became the first black players in the New England League. Newcombe's breaking of the color line in the New England League was one of many "firsts" in his career. In addition to being one of a handful of blacks in the majors when he made his 1949 debut, he was baseball's first Cy Young Award Winner, winning both the MVP and Cy Young Award in 1956. He was the first player in baseball to be a Rookie of the Year winner that captured the aforementioned dual honors in the same season. 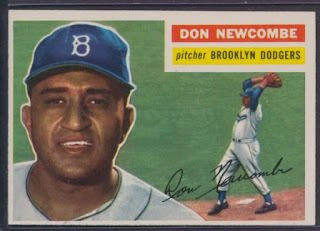 Newcombe is the last living link to the early African-American Brooklyn Dodger players that endured vicious racial taunts, Jim Crow segregation, and the weight of the entire black community during their quest to play baseball on the sport's brightest stage. Twenty-years prior to Dr. King's assassination, Newcombe and company were laying the groundwork for the civil rights movement. The camaraderie displayed on the field throughout the entire Brooklyn Dodger ball club, crossed racial boundaries to achieve greatness in America's national pastime. These pioneers planted the necessary images for our country to begin to advance race relations. Some 28 days before Dr. King was assassinated, he visited Newcombe in Los Angeles. King was in the midst of an exhausting tour of speech-making and sought the company of the Dodger great. In a 2009 interview with the New York Post, Newcombe relayed Dr. King's epic words. "Don, you'll never know how easy you and Jackie and Doby and Campy made it for me to do my job by what you did on the baseball field." Let these words marinate as an example of Dr. Martin Luther King Jr.'s character as he is honored on this monumental day.